The Shuttle Endeavour flyby, its final voyage before going on display in LA, took it over some places in Central California, bidding farewell. 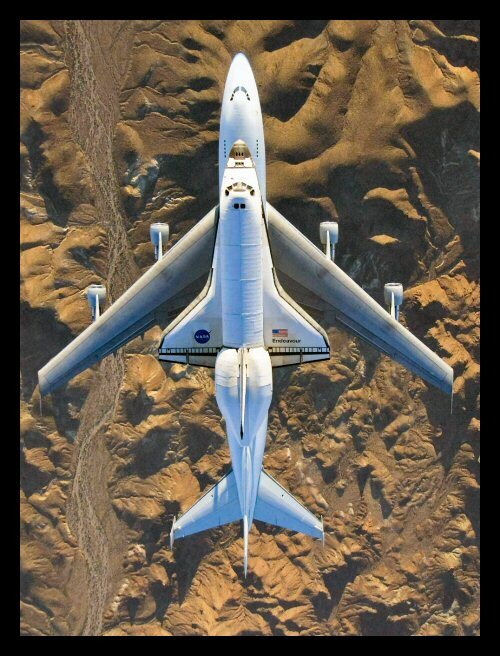 The current Photo of the Week shows the now-retired space shuttle Endeavour being transported by NASA's specially modified 747 after one of its last missions in 2008. This scene is being re-enacted over the skies of Central California even as I write this. The shuttle program has ended after three decades and the individual shuttles have been de-commissioned and will reside at museums across the country. The Endeavour will now be housed in a museum in Los Angeles. As it takes its last flight, recognition is being paid to places that were important to the shuttle program's development by low overflights. Some of these places in California are in the San Francisco Bay area. In Central California the shuttle will pass over the Monterey Bay area and Santa Cruz, then fly down the coast and pass over Vandenberg Air Force Base in Santa Barbara County near Lompoc. The last leg will bring it finally to its home in Los Angeles. Certainly Florida and Texas and the Lancaster/Palmdale area north of LA come to mind when thinking about aerospace programs. But Central California? Why the Shuttle Endeavour flyby here? Vandenberg AFB was to have been a launch facility for the shuttle program in addition to Cape Canaveral in Florida. But the Challenger shuttle disaster in 1986 nearly put an end to the shuttle program and certainly ended Vandenberg's role. Vandenberg does launch rockets with payloads of various kinds from here. These launches are spectacular and especially so when they occur during twilight or full darkness. Given how high these rockets soar, they can be seen here on the Central Coast as well as from most of Southern California. 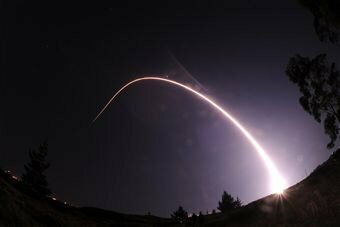 Information on upcoming Vandenberg launches is available by calling the Straight Talk Line at 805-606-VAND (8263). Launch day and time is released three to five days in advance and is available on the hotline during that timeframe. Beyond that, only the month and year of the next planned launch will be posted. The Air Force Base is also home to The Space and Missile Heritage Center which preserves and displays artifacts and memorabilia to interpret the evolution of missile and spacelift activity at Vandenberg from the beginning of the Cold War through current non-classified developments in military, commercial, and scientific space endeavors. The Center located at Space Launch Complex 10, is a National Historic Landmark and open for regularly scheduled tours through the Public Affairs office at (805) 606-3595. Now, you may have already been through Central California and have a great vacation photo and a story to go along with it.